Aokigahara: The Perfect Place To Die? | Spell Hub. Brining the occult to life. Aokigahara: The Perfect Place To Die? The approximately 14-square-mile section of nearly impenetrable forest nestled at the northwest base of Mount Fuji is sometimes referred to as the “Sea of Trees”. This rather enigmatic landmark might actually be one fondly renowned for its astonishing beauty if it wasn’t, in fact, for its current far more disheartening and ominous distinction. The unfortunate reputation of the Aokigahara forest originates from its lengthy history of unmitigated darkness and sorrow. The tragic events consequential of this atmosphere of intense hopelessness have earned Aokigahara the additional nickname of “Suicide Forest”. Sadly, this is an unembellished title, as the forest has become the most popular site in Japan for committing suicide and one of the top three in the world. To understand how the Aokigahara forest has developed into such a notoriously unsettling location, it is crucial to look at several contributing factors that have collectively transformed this unassuming slice of nature into what is now being called “the perfect place to die”. Elements of history, mythology, and culture all play significant roles in the fact that hundreds of suicides have been confirmed in the forest to date, and the numbers continue to rise despite the best efforts of local law enforcement and preventative measures that have been implemented in recent years. According to Japanese legend, the earliest deaths to occur in the Aokigahara forest were related to an ancient custom known as ubasute. This controversial practice allegedly involved the abandonment of elderly relatives during times of famine or drought. The family elder would simply be carried into the forest, then left there to die by means of starvation, dehydration, or exposure. These brutal deaths were thought to continue into the 19th century by some accounts and were considered to be the ideal scenario for creating yurei, ghostly figures of Japanese folklore that are consumed by their need for vengeance. 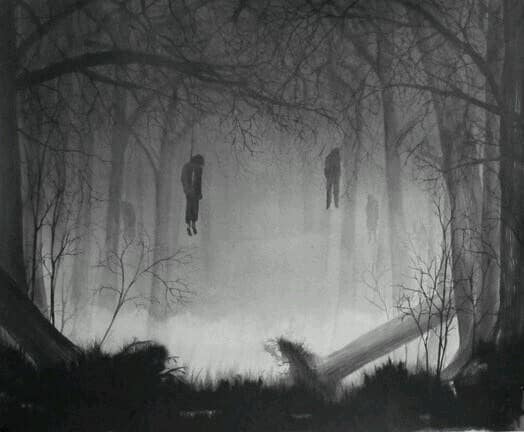 The Suicide Forest is believed to be teeming with these bitter phantoms, still mercilessly haunting anyone who dares to cross their path. While there are spiritualists who may assert that aggrieved yurei have some influence on those who enter the forest with suicide on their mind, others would argue that angry ghosts aren’t the issue of concern. Instead, a cultural history where suicide has been deemed as an honorable act seems to be a more pragmatic cause for worry in that situation. The Japanese have a long history of dignified acts of suicide, especially among members of the military. Seppuku, a ritual disembowelment suicide was a noble action reserved only for Samurai warriors. Similarly, wives of Samurai also participated in ritual suicides called Jigai, which involved swiftly cutting the arteries of the neck. Honor suicides known as hara-kiri still exist today, and an overall tolerance for suicide is observed by modern Japanese culture. With a generally lenient societal attitude already in place, when matters are compounded for individuals with things like unemployment and recession it isn’t difficult to see why suicide rates have dramatically increased in Japan since the early 1990s. Additionally, once mental illnesses, such as clinical depression, and daily social pressures are factored into the equation it becomes considerably clearer why suicide has become a national issue in Japan. Statistics indicate that an average of 70 people committed suicide on a daily basis in Japan in 2014. In the Aokigahara forest during 2010 over 200 people attempted suicide and 54 of them were successful. In more recent years the numbers have been withheld from the public in an attempt to improve the image associated with the forest. Also, signs have been erected at the forest entrance urging people to think of their families and talk to someone before making an irreversible decision to end their life. However, there is still an annual body search that has been conducted by police, volunteers, and journalists since 1970, and around 100 new bodies will be discovered in an average year. There is a myriad of reasons that one might decide to go to Aokigahara to spend their final moments. It could be because it is serene and beautiful, or because it is quiet and isolated. I suppose it is even possible that there could be darker forces that might draw in misguided souls who have simply lost their way. Regardless of the reason, it has become a common belief that those who die in the dim forest are in some way absorbed by the trees and the earth, actually becoming a part of the forest itself. If that is the case, then maybe it is actually the perfect place to die, because the fact is that no soul, no matter how hopeless or broken, is ever truly lost there. They are simply transformed from beauty in the human form to beauty in the form of an astonishing Jukai…a Sea of Trees.